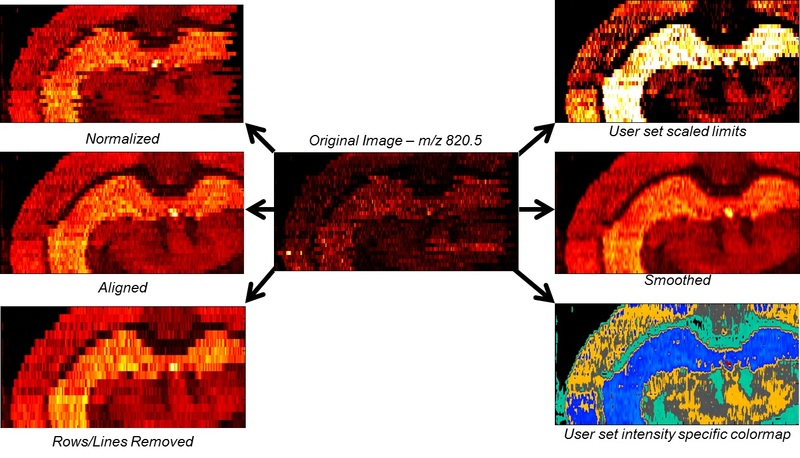 Mass Spectrometry Imaging options available in the new PNNL MSI QuickView tool. Results: Usually, scientific research means conducting an experiment and then evaluating the results to see whether it worked and for possible discoveries. Now, a new tool specifically for High Resolution Mass Spectrometry developed by scientific data management researchers at Pacific Northwest National Laboratory provides the first step toward achieving real-time analysis. MSI QuickView provides a critical component to view what’s going on during an experiment as it unfolds. This moves the process away from post-experimental analysis toward both active observation and influence. MSI QuickView is part of REXAN (A Rapid Experimental Analysis Framework), a library of data management software components developed at PNNL. REXAN provides access to high performance analytical components that can be quickly assembled into high-speed data analysis pipelines for different experimental instruments. Why It Matters: Understanding what is happening at the molecular level during chemical, materials, and biochemical processes is fundamental to addressing multiple scientific challenges. But the tools for researchers to achieve this level of clarity simply have not been available. Instead, they have been observing after the fact using secondary sources and mathematical models to determine what is going on. Even with computational assistance, validation can take many hours, days, or even months, depending on the type of experiment. Ideally, researchers want to know the results much sooner, if possible while the experiment is still ongoing, so they could potentially influence specific outcomes by triggering and observing reactions. MSI QuickView enables a new way of conducting experiments by providing interactive analysis of mass spectrometry imaging data within seconds. This near real-time analysis during the data acquisition stage helps validate whether a particular experiment was successful. The tool also allows for the analysis of unlimited data volumes, 3D visualization of multiple layers of sectioning data, and integrated data management; and it is highly flexible and adaptable for use in other domains. Methods: The PNNL team developed the new concept by looking at the existing analysis process and dividing it into needed mathematical and visualization components. They then optimized the components to perform analyses faster by implementing a different mathematical approach, analyzing the data differently, and using computer science methodologies to make the codes run faster. Then, they integrated these approaches into a single product. What's Next: The team is building a library of tools designed to allow the user community at large to share the software without having to start from scratch each time. The user service aspect of the library provides users the ability to try new pipelines on their data and compare it to their existing ones. This work was supported by PNNL’s Laboratory Directed Research & Development program through the Chemical Imaging Initiative. It is part of both the Science of Computing, Biological Systems Sciences, and Chemical Imaging research areas. Research Team: Kerstin Kleese van Dam, Matthew Thomas, James Carson, Abigail Corrigan, Daniel Einstein, Zoe Guillen, Senthil Kabilan, Andrew Kuprat, Carina Lansing, Dongsheng Li, Yan Liu, Paulo Pinheiro da Silva, Seun Ryu, Brandi Heath, Ingela Lanekoff, Julia Laskin, Matthew Marshall, Erin Miller, Gayla Orr, Craig Szymanski, Nancy Hess (PNNL). Reference: Kleese van Dam K, M Thomas, JP Carson, AL Corrigan, ZC Guillen, BS Heath, AP Kuprat, IT Lanekoff, CS Lansing, J Laskin, D Li, Y Liu, MJ Marshall, EA Miller, G Orr, P Pinheiro da Silva, S Ryu, CJ Szymanski, and M Thomas. 2012. "REXAN – A Rapid Experimental Analysis Framework." Presented by Mathew Thomas at the 8th IEEE International Conference on eScience 2012, Chicago, Illinois October 9.